Shell to Sea spokesperson Terence Conway stated "In the case of Shell not only were they above the law but the Gardaí encouraged and assisted Shell in breaking the law. 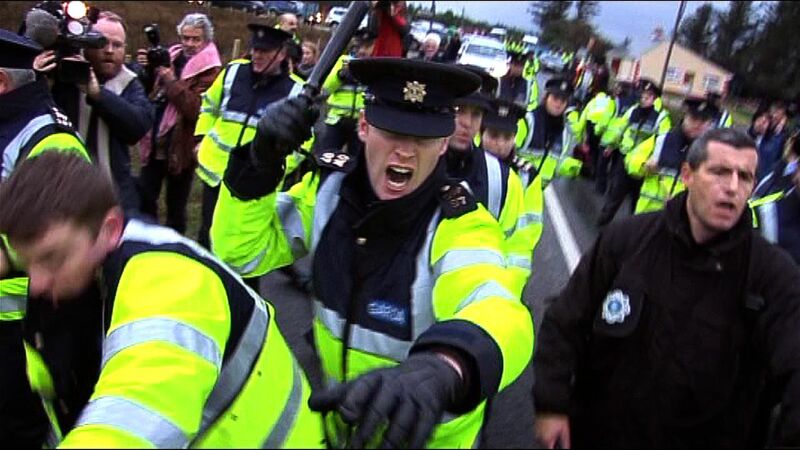 At the time of the baton charge the Gardaí had a stated 'no arrest' policy and the companion of that 'no arrest' policy was an assault policy in which Gardaí just beat up peaceful protestors". Shell to Sea spokesperson Maura Harrington stated "The policing of the Shell/Corrib protest in Erris set the template for state policing of any people protest as has been clearly seen in the Right2Water campaign; in this state, accountability 'comes dropping slow' - but come it will ..."
 Frontline Report: "Breakdown in Trust: A Report on the Corrib Gas Dispute"